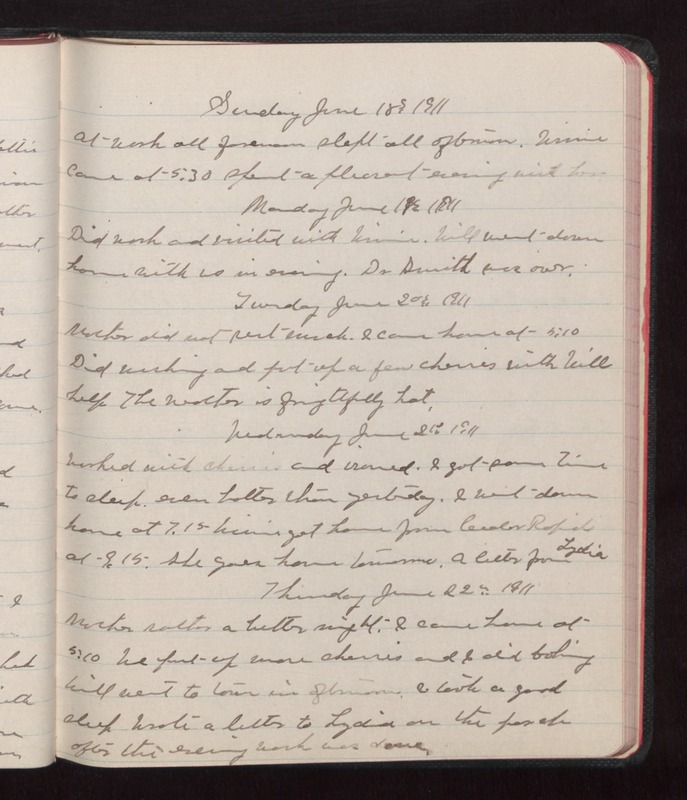 Sunday June 18 1911 At work all forenoon slept all afternoon. Winnie came at 5.30 spent a pleasant evening with her. Monday June 19 1911 Did work and visited with Winnie. Will went down home with us in evening. Dr Smith was over. Tuesday June 20 1911 Mother did not rest much. I came home at 5.10 Did washing and put up a few cherries with Will help the weather is frightfully hot. Wednesday June 21 1911 Worked with cherries and ironed. I got some time to sleep. even hotter than yesterday. I went down home at 7.15 Winnie got home from Cedar Rapids at 9.15. She goes home tomorrow. A letter from Lydia Thursday June 22 1911 Mother rather better night. I came home at 5.10 We put up more cherries and I did baking Will went to town in afternoon. I took a good sleep Wrote a letter to Lydia on the porch after the evening work was done.